Magnetic resonance (MR) imaging is readily applied for the diagnosis of advanced structural abnormalities associated with arrhythmogenic right ventricular dysplasia (ARVD). However, the earliest morphologic or functional abnormalties in ARVD on MR imaging have not been previously described. To describe MRI findings in phenotypically confirmed cases of ARVD with negative or borderline MRI diagnosis. The Multidisciplinary Study of Right Ventricular Dysplasia aims to characterize the clinical and genetic aspects of ARVD. As of September 2007, 87 newly diagnosed probands were enrolled and phenotyped as affected following the results of invasive and non-invasive tests and based on the task force criteria. MRI was performed in 73 patients (84%) according to a standard protocol at enrollment. During enrollment the MRI was anonymized and interpreted by the core lab in a blinded fashion and categorized as affected, unaffected or borderline. Phenotyping was performed by the PI based on the results of invasive and non-invasive evaluation. Following the final phenotype, MR images of ARVD probands that were initially classified as borderline or unaffected by the corelab were reanalyzed to determine early structural alterations in ARVD. Patients with borderline or unaffected MR imaging diagnosis were compared with patients with definite MR imaging diagnosis of ARVD using Student's unpaired t-test. Of the 73 patients enrolled and phenotyped as ARVD, 35 (48%) were classified on MR imaging as affected (group 1) and 30 (group 2) were classified as either borderline (n = 18, 25%) or unaffected (n = 12, 16%). The remaining 8 (11%) had uninterpretable MRI examinations. RV end-diastolic volume, end-diastolic diameter and RV outflow tract area were significantly higher and RV ejection fraction was lower in group 1 compared to group 2 (table in Figure 1). No differences were detected in left ventricular volumes and dimensions. 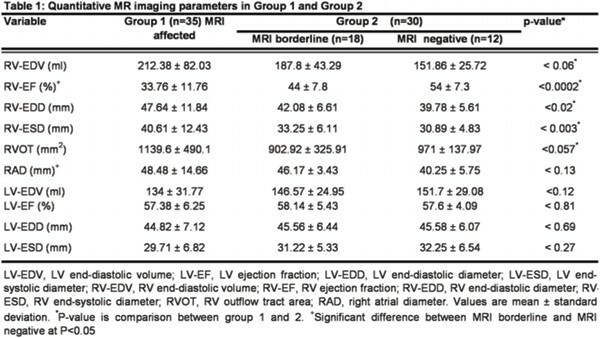 RV ejection fraction and atrial diameter were significantly worse in patients with borderline ARVD diagnosis on MR imaging compared with the unaffected at P < 0.05 significance level. Qualitative MR imaging abnormalities in group 2 included dyssynchronous and delayed contraction of the RV basal free wall and the out flow tract in 11 patients (37%), mild RV dilatation in 7 (23%), micro aneurysms on the RV free wall in 5 (17%), and RV hypokinesis in 4 patients (13%). RV intramyocardial fat was observed in 4 (13%) patients in group 2 and thinning of the LV lateral wall in 1 patient. Dyssynchronous contraction of the RV basal free wall was frequently seen on MR imaging in patients with early ARVD. This finding may represent earliest phenotypic expression of ARVD on MR Imaging. Delayed and dyssynchronous contraction of the RV basal free wall is frequently seen in patients with ARVD who otherwise lack major global and regional contraction abnormalities. This finding may represent an earliest phenotypic expression of ARVD on MR imaging.